What have they found so far this year? Although the Gunung Leuser National Park is protected by law, the National Park authority do not have sufficient resources to patrol the area. Development on the border of the national park is leading to encroachment into the protected forests, and we are seeing an escalation of hunting, poaching and illegal forest clearance. Local NGOs such as the Orangutan Information Centre offer additional rangers and technology to support these patrols. Our partners in Sumatra are deploying community-based forest patrol teams to tackle wildlife and forest crime. So far, the teams have removed 156 snares from the forest, and 16 people have been prosecuted. This is a great result, but we need to scale up our efforts to cover more ground so that more forest and wildlife can be kept safe. The patrols collect evidence of illegal activities, leading to prosecutions, which in turn act as a deterrent against future poaching and forest destruction. Involving local communities helps us to grow support for conservation, while training the next generation of rangers. This work complements our sustainable development projects, providing alternative livelihoods to villages adjacent to the park. This holistic approach is supporting government and communities to protect forests and wildlife. In January and February 2017 the patrol team have been busy, conducting three lengthy forest patrols. Two of these were a general forest security patrol, looking out for signs of illegal encroachment and poaching and one patrol was specifically surveillance of palm-oil supply chains. By their very nature, these patrols can occasionally find several encroachments and sometimes find nothing, but the very fact that they are known to be around serves as a deterrent in the area in question. They usually make their decision on where to patrol based on inside information as to where poachers or loggers have been seen. In the January forest security patrol, the rangers discovered 5 illegal logging camps, 1 fishing camp, 7 signs of wildlife. In February they encountered 5 hunting camps, a fishing camp. They also saw deer and elephant, as well as traces of other wildlife. One of their tasks is to inspect the boundary markers to check they have not been moved and are still surrounded by intact rainforest. Although they are accompanied by Rangers from the National Park authority, it can be difficult to enforce the laws; during the February patrol for instance, they were told by a local farming co-operative that they had been forced to sell part of their land to a known timber merchant. It took a long time to unpick the story, but eventually a compromise was reached whereby the timber merchant pledged a different bit of land to the co-operative and a separate piece of land to be returned to rainforest. This may not seem like an ideal solution, but the practical realities of working on the ground often mean that compromise is more effective both in the short-term and also in terms of having the vital co-operation of key players in protecting the forest in the future. 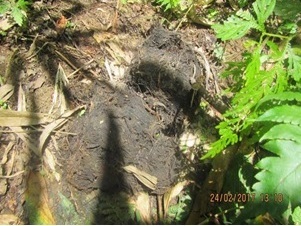 These are some bear tracks found by the rangers. A good sign that wildlife is thriving in this area of forest. But poachers and hunters have been here too. Their camps are dotted around the forest and when they come across them, the rangers destroy them.